Its no secret, I’m all about dominating the competition! That’s the fun part… a big reason to be in business and that’s what separates the business owners from the entrepreneurs. We’ve all been to those rockin' restaurants that have the triple combination of food, service and ambiance. You know, you can feel the magic going on and usually there’s a long wait for a table no matter what day it is. All three of those elements are important to real success and most of the time I say that service is a true competitive advantage, but lets focus on the ambiance. Ambiance, your “hooks” and WOW Factor are what get people talking and better yet online posting, creating and sustaining a buzz for your place. But it takes more than just cosmetics. Its really about getting into the heads of your target audience and your regulars. What are they jazzed about? Is it lifestyle, is it something they can relate to? Or is it just delivering an all around great experience? Its really all these things combined. There is no magic formula to Rock Your Restaurant… there are ideas, there are systems, there’s vision, but most of all it comes down to execution. 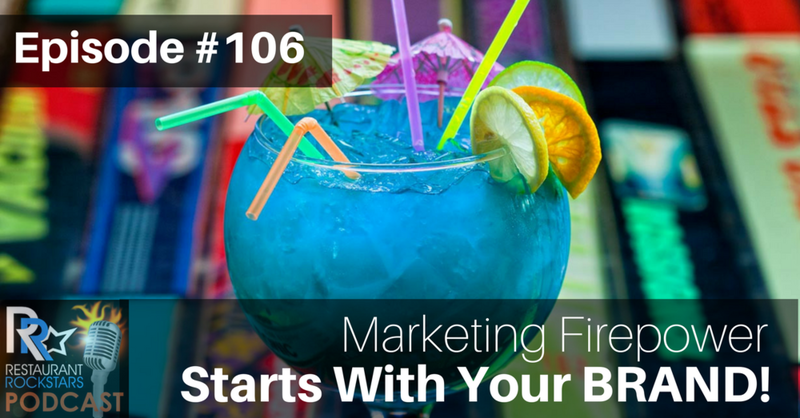 Check out this episode as Thea and I riff on what it means to build a brand. Give a listen, you just might get your next big idea that inspires your success. Roger: Welcome back to The Restaurant Rockstars Podcast. Engaging topics to help restaurants rock their profits, build their brands and that's going to be really important today and deliver amazing guest service experiences. I'm back again with my lovely wife Thea who always has a great opinion on whatever I’m podcasting about. So, I'm getting clued to her once again in today's episode all about the power of your brand. So, I'm a huge believer of ambiance; that is one of the three critical elements in a successful restaurant, the other two being food and service but let's talk ambiance for a minute. Roger: So you know brands, let's talk about a national brand right now that just resonates with me because we really like this chain, it's called the ‘Cheesecake Factory’ and they're nationwide and obviously their biggest hook is the cheesecakes. And you walk in the front door and they have these huge glass cases that probably have 75-80 different varieties of cheesecake and you name it; there's probably a cheesecake that you can order. So, that just sort of resonates with me because it's a fun place it's a lively atmosphere it's always usually crowded but the service is really great and the food is really great also. So they hit it just right off the head, don't we enjoy going there? Thea: Yeah, the kids love it. Roger: The kids do love it; I mean the servers treat our kids as well as they treat us which is another important thing. Thea: Well, speaking of that I remember asking a server once because their menu is enormous. Roger: It really is, yes. Thea: I can't wrap my head around the number of items on the menu and then how much, but the kitchen must deal with in their inventory to supplies that sort of thing, right? Roger: And the prep, it just goes on and on. Thea: I'm fact that the servers know that menu inside and out; when you go to a standard restaurant and the servers don't know the menu, it's shocking to me when at the Cheesecake Factory they do and it's so extensive. I remember asking a server once how is it that you know the menu so well when it's so expansive? And she said, “It was a month, we have to literally study for a month before we're allowed to hit the floor”. And then they hit the floor, sometimes you talk about in the sales or server training but this brand actually you know holds their thumb over it; they are not they come in full time for a month just to learn the menu. Roger: That serious training, and that's a serious commitment to training and we're big believers in that as well. So, there is zillions of restaurants out there in different kinds of restaurants there's Mom & Pop and there's Diners and there's Sports Bars and there's Fast Casual and there's Food Trucks and you know there's full serve sit down dining and then there's five-star white linen tablecloths and napkins and maitre D-type service and everything deep down in-between but you know it really does come down to are you just another restaurant or are you really setting yourself apart from the competition and what are your hooks? What kinds of things do you do to build your brand? And that takes us back to our old restaurant in Maine the Matterhorn Ski Bar and it was specifically branded to appeal to the customers that really sort of frequented the area, we were at a Ski Resorts; of course we had a Ski Resort theme everything was about you know it was the history of the sport of skiing. It was a tribute to skiing there was a quick mint you know there were old skis from every decade and boots and by adding these errors there were 847pairs of skis hanging throughout this restaurant and you'd go into the bathrooms and there be skis and they'd be underneath the bar top. Thea: And that was a contest, a kid's contest right and that was a great this is a great idea hits contest that kept the kids occupied you know kids often get bored with [yes, yes, it was awesome] and so there was one I don't know if it was more than one year, you ran the contest. Roger: It took 2 years before someone hit for exact number. Thea: How many ski user pairs of skis I think some of these individual skinny right are there in this restaurant? And the kids would walk around like for hours trying to count and catch every single one and about 2years later someone actually had it. Roger: Well you know it's interesting because this particular promotion not only created excitement for the customers but it brought them back again and again because their kids wanted to keep counting those skis; we had a fantastic prize I forget what it was but it's always about the hooks and that was certainly one of our hooks but it all goes back to the theme of the restaurant. And how many marketing promotions can you do around your theme to create excitement for the customer and bring them back? Roger: Right, operate ski is important as the skiing itself when people come off the hill at the end of the day, they want to come in have a beer have some food and just share the stories of the day and what happened and it's all part of the lifestyle and all part of the experience and you know that is a hook in our restaurant. And that brings to mind a local place now which I'm really sort of fond of that we've been through numerous times and it has a theme this is an outdoor active community where we live now in Sun Valley Idaho and biking, mountain biking and road biking and all that sort of thing is a huge part of the culture and lifestyle here in Sun Valley. So, there is a restaurant called The Power House and it is total bike nerd geek heaven, it's nirvana for anyone who likes bikes or rides bikes and you walk in the door and there are old vintage bikes hanging from the ceiling right up to present day. And the owner has the really amazing bicycle collection; half of which are displayed half the time and they have tables and underneath the tables there's memorabilia from the Tour de France in the glass of the table itself. And here's the biggest took the and I know you I just told you about this because you probably wouldn't have recognized it had I not told you but the bar itself is in the shape of a bicycle derailleur or if you know what that is, the derailleur on a bike is what changes the gears on a bicycle. And so, it's this whole long bar and then there's actually this big Kag of gears at the end of the bar and people, customers sit around the actual gear itself and the Bartender the other day actually showed me that it spins. So, while you're sitting there drinking your drink he can actually spin the rear gears on this derailleur or so that is way cool. Thea: And the napkins, shop towels. Roger: So everything about it is just so on brand and so consistent with the theme and here's the kicker, I went into the men's room the other day and I just noticed this for the first time but in the stall, there is a toilet paper holder that is actually the stem or the headset of a bike. It's the part of a bicycle that holds the front forks and holds the front wheel on and this actually holds the toilet paper roll, instead of the wheel it's a toilet paper roll. So I'm like whoa, you know how totally right down to the toilet paper are they on brand and theme and it's just what just very quickly I see it working. Thea: It’s actually a bike shop. Roger: Which is right in the middle of the restaurant, which is a hook. Thea: And for a while at that matter horn, you had ski tuning. Roger: I'm glad you brought that up because if you didn't, I was certainly going to so. Here's a hook, while people are having their apres ski experiences that are old restaurant we actually had a person tuning skis, waxing skis while you wait right in the middle of the bar and that was a huge hook. So, all of this just sort of comes down to the power of a brand and all these things that you can do just to get to capture the public's imagination. But more than that it's also to make sure that you're on target with what their expectations are, what their likes are and if you can do that well no matter where you are, then you've got a winning formula for success I believe. Thea: I think so too it's about speaking to your customers both of you know obviously both of those places spoke to their customer I think you know we start with the Cheesecake Factory, that speaks to so many people. Their menu is so vast, there’s something for everybody and they have the amazing cheesecakes and they have all the specialty drinks. I mean it just feels festive and then the servers and the wait staff and the host like it's just so dialed that it always makes for a family favorite. Roger: Extensive beer collection Krauts the hours and if you name it whatever beer that you want to drink you're probably going to find it there because you know this place is also really dedicated to the food in the spirits in addition, I mean the beers, the spirits and the wines in addition to the food, they do a great job all the way around. And service, there is just you know it's really personal you come in and you can just tell that the people really care; they're not only attentive and personable but they really want you to know what you know what the place is all about. They make lots of recommendations on what you're going to enjoy and I always appreciate that you know obviously there's training going on at the Power House every day also because it doesn't happen by accident. Roger: Actually biking events and cycling events from around the world and mostly in Europe, they recently had all the Olympic events going on so it's just a gathering place that brings the community together and people just like our place people would come in and they're ski gear and now people come in and there's bikes on the racks of their cars and they come in in their bikes shoes in their shorts and you know it's just the vibe. And that's really the word vibe and Vibe is a combination of your food, your service and your ambiance, all three are really, really important and it's what you know it's what separates a restaurant from a brand in my book. So, you don't want to be a restaurant, you want to be a brand and the business and you know you don't want to be a restaurant or a business owner, you want to be an Entrepreneur and that takes vision and innovation and staying ahead of the competition and that's the difference. Thea: I also think it goes back to the food because I think sometimes they do all ‘wow factor’ for the ambiance and then they forget the food really does matter. [yes] we thought that this last weekend when we were out and trying to go to a couple of breweries and we saw one that was great, the menu was fantastic and they had a wait and we've been there before and then we went to buy another brewery that had like a couple of cars in the parking lot and then other restaurants that had no cars in the parking lot. So, you know like people like that brewery for the ambiance. It's warm has an breck it was just a really cool vibe. There you go with vibe again and the food was fantastic and we heard about it on the chair lift; so we know that that there are loyal customers that are talking about it all the time. So, I think it takes all of those factors. Roger: It does, so to close out the episode, you just hit the magic he magic you know phrase; it's word of mouth marketing and I've proven over 20years in the business that word of mouth marketing will always be your most effective, most cost effective and powerful form of marketing and word of mouth will build your brand. So, know that people are talking about your food, your service and your ambiance you've got to hit all three and that's today’s episode.